It's difficult finding a good green job today, even after spending $110 billion in stimulus money to help create them. Newly formed green energy companies such as Solyndra, Evergreen Solar, and Green Vehicles are going out of business and newly converted green energy companies such as General Electric are outsourcing manufacturing jobs to cheap-labor countries. Nevertheless, many in government, especially the White House and the EPA and DOE, believe there will be plenty of future green jobs to go around - 5 million, high-paying ones, according to President Obama. The reason for their optimism may lie in the expectation that millions of Americans will soon transition to energy efficient homes. Although the parts and materials may be manufactured in other countries, the houses must be built and maintained here. 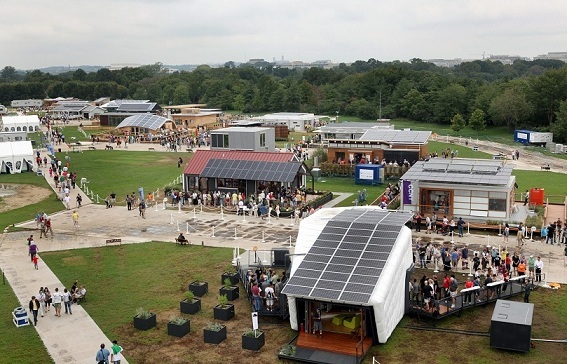 They have been, no doubt, buoyed by the 2011 DOE-sponsored Solar Decathlon, a competition among collegiate, architectural teams "to design, build, and operate solar-powered houses that are cost-effective, energy-efficient, and attractive." The picture below shows the excitement surrounding the program. To be fair, the Decathlon got off to a rainy start - good for neither attendance nor electricity generation. However, the inclement weather obviously failed to detract from the beauty of these earth-friendly, sustainable homes. A government source, who wishes to remain anonymous, exclaimed that he, "envisioned entire communities of these cost-effective, energy-efficient, and attractive dwellings sprouting up throughout the land. The demand may exceed that of wind farms." Such innovative designs underscore the wisdom of government programs spending hundreds of millions of dollars to train people for the coming green economy. Clearly, existing builders are not able to construct such ecological marvels, as advanced as they are beautiful. Indeed, to non-green tradespeople, even the new building codes will be incomprehensible. And remodeling companies and do-it-yourselfers will be sorely unqualified to handle renovations and repairs. But, a government source, who wishes to remain anonymous, predicted that "when millions of Americans begin to abandon their inefficient and wasteful homes for these cost-effective, energy-efficient, and attractive dwellings, a highly paid green energy workforce will be at the ready." The offering in the forefront is from the California Institute of Technology, one of our most prestigious engineering schools. As can be seen in the enlarged, twilight view below, it's parka-esque look (siding from LL Bean?) exudes warmth. And if the house becomes too warm (retains too much captured solar radiation), there's no better way to cool off than to luixuriate in the crisp (and now cleaner) sunset air whisking across your spacious deck. There, you can sink into an eco-friendly folding chair and ponder your energy savings while enjoying a panoramic view of our planet healing. The Cal Tech house and the other contenders will seem diminutive and trifling to people with that antiquated "a man's home is his castle" attitude. But, as a government source, who wishes to remain anonymous, hastened to remind, "the goal of the competition is to demonstrate cost-effectiveness, energy-efficiency, and attractiveness." Consumers desiring bigger homes could simply purchase an enlarged version of their favorite design or integrate multiple units into a structure of the required size. This latter option is more easily implemented with rectilinear structures such as the City College of New York design below. The CCNY offering is 750 square feet. A young couple seeking a starter home need only purchase two units and have them contiguously integrated into a 1500 square foot home, much like bolting together two double-wide mobile homes. The inherent flexibility of this modular approach permits end-to-end or side-to-side bolting. And, as the family grows, additional units can be readily attached. According to a government source, who wishes to remain anonymous, "this should be performed by properly trained, authorized and qualified green energy technicians." There is no question that all of the teams have done a great job improving energy efficiency. 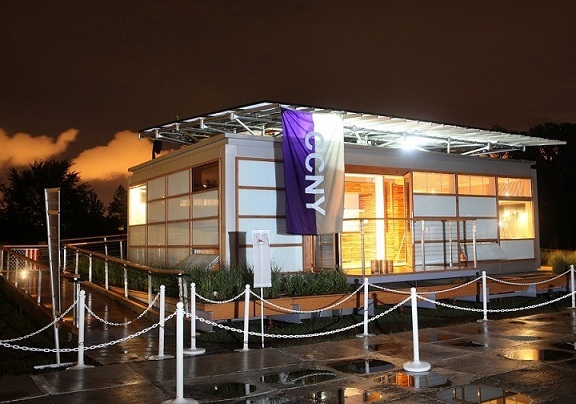 For example, the CCNY house is able to create up to 8 KWs of free energy on sunny days. Purchasers of these homes will reduce their electricity bill by hundreds of dollars annually, thereby shrinking the time to recoup their solar investment. The CCNY house is $500,000. But this only covers materials. A conservative estimate of labor cost would be $125,000 (25% of the materials cost). With green labor, $200,000 (40%) is more realistic. Throwing in another $100,000 for the building lot and other expenses brings the total to $800,000. In this scenario, the young couple's 1500 square foot, starter home would cost $1,500,000. Let's assume the couple comes up with the $300,000 (20%) down payment and can afford the monthly mortgage payments (perhaps by the time they are ready to buy, they will have high-paying green jobs). Further assume that their resulting energy savings are $2000/year. Their investment recovery time would therefore be, well, 150 years. 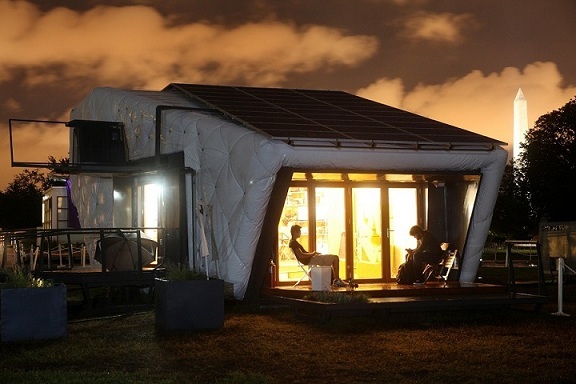 Imagine the cost-effectiveness of the designs from teams that didn't qualify for the Solar Decathlon? Such calculations can be misleading because they fail to account for green goodwill, an intangible, salable asset representing the value your investment contributes to saving the planet. It is salable in that you can add this to the future selling price of your home. A government source, who wishes to remain anonymous, explained, "it is an additional amount that a prospective buyer, equally ignorant and gullible, would be willing to pay for your cost-effective, energy-efficient, and attractive solar home."